the appendix masculina is twice as long as the appendix externa and can therefore provide a more easily visible distinction between the sexes. As noted in section 3.2.1.1, the sixth somite bears the rigid uropods which, together with the telson, form a very effective propulsive structure (tail fan) for reverse movement. 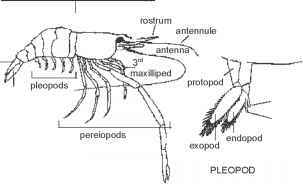 A number of important morphological characteristics differentiate caridean prawns from penaeid shrimp (Fig. 3.3). In all carideans the second abdominal pleura overlap both first and third pleura, and the terminal chelae on the third pereopods are lacking (McLaughlin 1980). An additional distinguishing feature is that most carideans, including Macrobrachium spp., have a smooth, rounded dorsal abdominal surface, while most penaeids have a sim ple or complex ridge at the dorsal apex of the abdomen (Fincham &Wickins 1976). This section is concerned principally with morphology, but necessarily and briefly discusses some important and related physiological aspects, for which further reading is referenced. 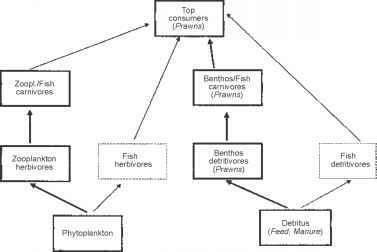 Decapod circulatory systems have been described by McLaughlin (1983); Bliss (1990) and McMahon & Burnett (1990), on whose work this section is based.